Insert Assembly Left Front Guide. This insert is adjustable to the rear guide for proper clearance and has a coolant channel for proper flow. Fits most Horizontal saws that use a 1" blade. Insert Assembly Right Rear Guide. This insert is non-adjustable and is attached to guide arm with a flat head machine screw. Fits most Horizontal saws that use a 1" blade. This guide also is the lower right blade guide for the TF14 and TF1421 DoAll Vertical Bandsaws. Mounts on Fixed Guide Arm. Insert Assembly Left Rear Guide. This insert is non-adjustable and is attached to guide arm with a flat head machine screw. It has a coolant channel for proper flow. Fits most Horizontal saws that use a 1" blade. Insert Assembly Right Front Guide. This insert is adjustable to the rear guide for proper clearance. Fits most Horizontal saws that use a 1" blade. This guide also is the lower left blade guide for the TF14 and TF1421 DoAll Vertical Bandsaws. Mounts on Fixed Guide Arm. This is the upper right blade guide for the TF14 and TF1421 Doall Vertical Bandsaws. This Guide Mounts Solid on Guide Arm. For a complete set of guides part numbers 141756,141757,110665 & 110669 need to be ordered. You can find the 110665 & 110669 under Catagory "Replacement Doall 1.00" Band Saw Blade Guides". This is the upper left blade guide for the TF14 and TF1421 Doall Vertical Bandsaws. This Guide is adjustable for proper blade clearance. For a complete set of guides part numbers 141756,141757,110665 & 110669 need to be ordered. 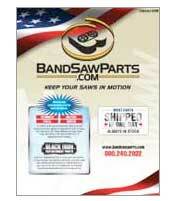 You can find the 110665 & 110669 under Catagory "Replacement Doall 1.00" Band Saw Blade Guides". This is a Left Rear Blade Guide, this guide will fit the following DoAll Machines: C-1216, C-260, C-305, C-333, C-1720, 410, 4100 The complete set of 4 will include the following part numbers:143271, 143272,143273and 143274.This Guide Mounts Solid on Guide Arm. This is a Left Front Blade Guide, this guide will fit the following DoAll Machines: C-1216, C-260, C-305, C-333, C-1720 The complete set of 4 will include the following part numbers: 143271, 143272, 143273 and 143274. This outside insert "floats" and is adjustable to Rear Guide for proper clearance. This is a Right Rear Blade Guide this guide will fit the following DoAll Machines: C-1216, C-260, C-305, C-333, C-1720 The complete set of 4 will include the following part numbes: 143271, 143272, 143273 and 143274. This Guide Mounts Solid on Guide Arm. This is a Right Front Blade Guide this blade guide will fit the following DoAll Machines: C-1216, C-260, C-305, C-333, C-1720 The complete set of 4 will include the following part numbers: 143271, 143272, 143273 and 143274. This outside insert "floats" and is adjustable to Rear Guide for proper clearance. These Blade Guides are manufactured to accomodate C80, C8015 and C1213 Band Saws that have been modified to use a 1 1/4"Band Saw Blade. 1 1/4" Left Rear Blade Guide Modified. This guide mounts solid on guide arm. These Blade Guides are manufactured to accomodate C80, C8015 and C1213 Band Saws that have been modified to use a 1 1/4" Band Saw Blade. This outside insert "floats" and is adjustable to Rear Guide for proper clearance. These Blade Guides are manufactured to accomodate C80, C8015 and C1213 Band Saws that have been modified to use a 1 1/4" Band Saw Blade. This Guide Mounts Solid on Guide Arm. These Blade Guides are manufactured to accomodate C80, C8015 and C1213 Band Saws that have been modified to use 1 1/4" Band Saw Blade. This outside insert "floats" and is adjustable to Rear Guide for proper clearance. These DOALL Guides are on DOALL TF Series Machines using a 1.25" Sawblade. This Guide Mounts solid to adjustable guide arm. A complete set will require one of each: 112089, 112090, 119350 or 119354. This guide "Floats" and is mounted to adjustable guide arm. These DOALL Guides are on DOALL TF Series Machines using a 1.25" Sawblade. This Guide Mounts solid to adjustable guide arm. A complete set will require one of each: 112089, 112090, 119350 or 119354. This guide "Floats" on lower guide post. These DOALL Guides are on DOALL TF Series Machines using a 1.25" Sawblade. This Guide Mounts solid to adjustable guide arm. A complete set will require one of each: 112089, 112090, 119350 or 119354. This Guide mounts solid on lower guide post. Right Front Insert 1 1/2" * This is a Right Back Blade Guide this blade guide will fit the following DoAll Machines: C-1220 and other DoAll 1.5" Horizontal sawing machines This guide mounts solid on Guide Arm. Right Rear Insert 1 1/2" * This is a Right Front Blade Guide this blade guide will fit the following DoAll Machines: C-1220 and other DoAll 1.5" Horizontal sawing machines. The complete set of 4 will include the the following part numbers: 147609,147610,147699 and 147670.This outside insert "floats" and is adjustable to Rear Guide for proper clearance. Left Front insert 1 1/2" * This is a Left Rear Blade Guide this blade guide will fit the following DoAll Machines: C-1220 and other DoAll 1.5" Horizontal sawing machines The complete set of 4 will include the following numbers: 147609, 147610, 147699, and 147670. This guide mounts solid on Guide Arm. Left Rear Insert 1 1/2" * This is a Left Front Blade Guide this blade guide will fit the following DoAll Machines: C-1220 and other DoAll 1.5" Horizontal sawing machines The complete set of 4 will include the following part numbers: 147609, 147610, 147699 and 147670. This outside insert "floats" and is adjustable to Rear Guide for proper clearance. This is an Upper Right 1 1/2" Band Saw Blade Guide, this guide will fit the following DoAll Machines: TF-24, TF-25 The complete set of 4 will include the following part numbers: 141942, 141943, 141944 and 141945. This outside insert "floats" and is adjustable to Rear Guide for proper clearance. This is a Upper Left 1 1/2" Band Saw Blade Guide, this guide will fit the following DoAll Machines: TF-24, TF-25 The complete set of 4 will include the following part numbers: 141942, 141943, 141944 and 141945 This Guide Mounts solid on Guide Arm. This is a Lower Right 1 1/2" Band Saw Blade Guide, this guide will fit the following DoAll Machines: TF-24, TF-25 The complete set of 4 will include the following part numbers: 141942, 141943, 141944, and 141945. This outside insert "floats" and is adjusted to Rear Guide for proper clearance. This is a Lower Left 1 1/2" Band Saw Blade Guide, this guide will fit the following DoAll Machines: TF-24, TF-25 The complete set of 4 will include the following part numbers: 141942, 141943, 1419444 and 141945. This Guide Mounts solid on Guide Arm. Doall Backup Insert 112075 For TF24 Band Saws. This Guide rides on the top of the saw blade, supporting the Blade during cutting. P DoAll 121210 backup guide will fit the C80, C70, C8015, C1216 horizontal pivot style band saw machines with the small style pivot bolt. This Guide rides on the top of the saw blade, supporting the blade during cutting. P DoAll 137511 backup guide will fit the C80, C70, C8015, C1216 horizontal pivot style band saw machines with the small style pivot bolt. This Guide rides on the top of the sawblade, supporting the blade during cutting. P DoAll 149003 backup guide will fit the C80, C70, C8015, C1216 horizontal pivot style band saw machines left guide arm with the larger style pivot bolt. This Guide rides on the top of the sawblade, supporting the blade during cutting. P DoAll 149004 backup guide will fit the C80, C70, C8015, C1216 horizontal pivot style band saw machines right guide arm with the larger style pivot bolt. This Guide rides on the top of the sawblade, supporting the blade during cutting. P DoAll 11529 This Top Roller Bearing acts as "Back Up" Guide supporting the blade during cutting.